No matter how big your church or how many classrooms you have, one of the most chaotic aspects of Sunday morning is getting everyone to the right place after they check in. Today, we are giving you the power to decide how you want Check-Ins to suggest people to locations. In each of your event folders you will see a new Distribution section. The Waterfall and Balanced distribution options are designed to suggest locations for new people, or those who haven’t attended in a while. Waterfall is a new name for the way it’s always been. Check-Ins automatically suggests the person to the first available location, based on your customized order. For example, if you have three 1st grade locations, each location will fill up to capacity before moving to the next location. The new Balanced setting suggests the location with the least number of people in it. This setting is helpful if you have multiple locations for an age group, like three 1st grade classrooms, and your priority is to make sure all the teachers have the same number of students. The final distribution setting is a checkbox for regular attendees. Leave this checked If you want regular attendees to be in the same, familiar classroom every week. 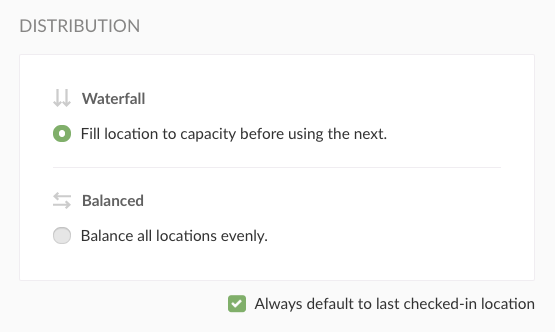 If unchecked, every person’s location will default to the chosen Waterfall or Balanced option. Learn more about distribution settings in the Settings.